Phi Delta Chi is committed to raising funds and awareness for worthy causes. One of the most notable causes the fraternity is involved with is St. Jude Children's Research Hospital. Since 1995, Chapters and Brothers of Phi Delta Chi have raised funds for St. Jude through various means. In August 2007, the Fraternity expanded support of St. Jude Children’s Research Hospital using a targeted letter-writing campaign called The Prescription for Hope. Through this campaign, the Fraternity pledged to raise $200,000 over 4 years. In April 2009, Phi Delta Chi surpassed this goal within just 2 years! Upon completion of this commitment, the St. Jude Children’s Research Hospital’s outpatient pharmacy located on the first floor of the Patient Care Center was named in gratitude of Phi Delta Chi. Most recently, the 67th Grand Council voted to continue their support of St. Jude Children’s Research Hospital through The Prescription for Hope fundraising campaign. Pharmacist’s Letter and their new Pharmacy Technicians University continue their commitment of a $20,000 matching donation to St. Jude on behalf of Phi Delta Chi. St. Jude Children’s Research Hospital hosted the strategic planning retreat for the Executive Council and Regional Officers in Memphis, Tennessee this past October. During this retreat, Phi Delta Chi Brothers enjoyed lunch with a St. Jude patient family to see firsthand how the money Phi Delta Chi fundraises benefits patients and their families. It was a very powerful experience to see how the support from St. Jude Children’s Research Hospital extends beyond diagnosis and treatment to caring for the whole patient. Brothers were given a tour and were shown the outpatient pharmacy located on the first floor of the Patient Care Center that was named in gratitude of Phi Delta Chi. The plaque adjacent to the pharmacy pick-up window reads, “IN GRATITUDE TO PHI DELTA CHI PHARMACY FRATERNITY FOR THEIR DEDICATION AND SUPPORT OF ST. JUDE AND ITS PHARMACY PROGRAM.” This pharmacy is located near the outpatient treatment registration area where approximately 200 patients are treated each day. 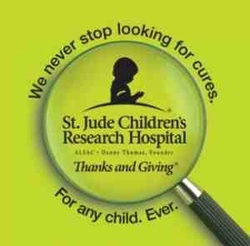 Thank you for your support of St. Jude Children’s Research Hospital! Click HERE to view the 2010 Phi Delta Chi Prescription for Hope video. Click HERE to donate to St. Jude on behalf of Phi Delta Chi today!